Christmas Daddies is an annual telethon held in early December. The telethon is a televised pledge-based variety show broadcast live on CTV. The program is a volunteer effort of the staff of CTV Atlantic and the station provides the airtime and equipment to make the production possible. A cast of hundreds – from the very young to the young at heart, volunteer their time to assist in the production. Duties include technical set up, taking phone pledges, running auctions and performing on the show. CTV and CTV Two personalities and special guests host the show, and encourage viewers to phone in and make pledges. As well, a large number of individuals, community groups and companies who have initiated their own fundraising efforts appear on the telethon to make cheque presentations. To read the story of how Christmas Daddies was started click here. How can I present a cheque during the telethon? Go to the contact page and select Halifax, Moncton, Sydney or PEI! Send an email and include your contact details: name, group or company name, mailing address and phone number. Please contact us asap as those spots tend to fill rather quickly. NOTE: there is no minimum donation required to present a cheque during the broadcast. Spots are given on a first come first serve basis. Someone will contact you and schedule a time for when representatives from your group will come to the CTV studios! We provide the big cheques to present on-air and we can easily accommodate a group of 4 -5 individuals. The funds you have raised will go back to your area! How do I contact Christmas Daddies? Visit our Contact page for all of our contact information. How do I submit a drawing for the Christmas Daddies Calendar ? It’s all about kids helping kids! Have your child create a beautiful drawing for us. Complete details are here ! Proceeds from calendars are returned to the area where they are sold to provide toys and food at Christmastime. How do I receive Christmas help? Christmas Daddies helps Maritime families in need at Christmas time by providing toys to families with children. The Salvation Army is our partner for the distribution and you must register to be on the list. How to register for Christmas Help will be updated in October of 2019. Contact your local Salvation Army Family Services. Click here to see locations in the Maritimes. If you are on income assistance and have questions about the form you received, please visit the Feed Nova Scotia website or call 902-457-2849. When is the Christmas Daddies Telethon? The 55th Annual Christmas Daddies Telethon live broadcast is Saturday, December 1, 2018 from 11 am – 6 pm (Atlantic time) on CTV. Is there an online auction this year ? Yes! We will be putting together an online auction once again, contact us if you would like to contribute an item! Check back closer to the Telethon live broadcast for the link to the online auction and get some Christmas shopping done and feel good about helping a child in need this Christmas! How can I honour my Christmas Daddies pledge? You can donate online with Visa Or MasterCard at any time! Pledges can be honoured at any branch of the Royal Bank in the Maritimes from December 1st-January 31st each year. Or at any Credit Union location on Cape Breton! Please be sure to honour your pledge (or make a donation) on or before December 31st to be eligible for a charitable tax receipt next tax season! I want to organize a fundraiser for Christmas Daddies, what do I do? Groups and individuals are always welcome to organize a fundraiser and present the funds to Christmas Daddies. We will even invite you to come appear on the telethon to present your cheque! Please contact the appropriate Christmas Daddies office (Halifax, Moncton, Sydney or PEI) and give us the details of what you would like to do! Send us an email and be sure to include all the facts: group name, contact name, address and phone number. Tell us about your event: include date, time and location. If you are holding a raffle draw or a 50/50 draw you will need to apply for a lottery license. Our office must first approve your event and provide you with a letter. You can then apply for a lottery license! Donations of $10 or more that include full name and complete mailing address will be issued a charitable tax receipt. A complete mailing address must include civic address (apartment number if applicable), city/town and postal code. Charitable tax receipts are issued by the Salvation Army and mailed by the end of February each year. If you made your donation via the website your charitable tax receipt will be sent by email. If you were expecting a charitable tax receipt and it did not arrive by the first week of March please contact the Mainland NS office and provide your donation details. How can I perform on the Christmas Daddies Telethon? Because our telethon’s goal is to help children at Christmas, we only accept musical selections with a Christmas theme. Your performance must be 3 MINUTES or less in length. You must record and upload to YouTube a recording of the song you wish to perform (recording does not have to be professional quality). You can make the YouTube upload unlisted and send us a link with your application. Download the Talent application form here. Fill in the form and email it back to us! Deadline for applications is the Tuesday following Thanksgiving every year. Although you are able to open the form in Firefox , it is not fill-able and the Submit Form button does not work. Are Christmas Daddies and the IWK Foundation the same organization? Christmas Daddies and the IWK Foundation are two different organizations. People sometimes confuse us as the same organization, as both Telethons are broadcast on CTV and both Telethons help Maritime Children. 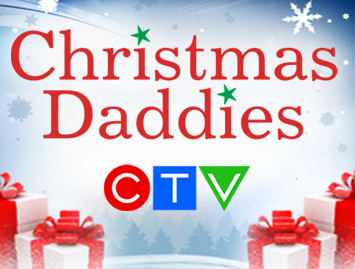 CTV Christmas Daddies is broadcast on the first Saturday in December. Christmas Daddies is a nonprofit organization. The production is a volunteer effort of the staff of CTV Atlantic TV stations. Christmas Daddies raises funds to provide for less fortunate children at Christmas. Funds raised are distributed by the Salvation Army. The IWK Telethon is broadcast in early June. The IWK Foundation is a registered charity. Donations fund world-class care for women, children, youth and families in the Maritimes at the IWK hospital in Halifax, NS and. Here is their link. How are the Christmas Daddies funds used? The funds raised through the Christmas Daddies program provide toys and for less fortunate children during the Christmas season. The Salvation Army distributes these funds throughout Nova Scotia, New Brunswick and Prince Edward Island. Funds are returned to the area from which they originated, as an example a donation from Bridgewater goes back to Bridgewater. Last year alone, more than 18,000 Maritime children and parents received toys and food at Christmas because donors contributed to the Christmas Daddies Telethon. How can I donate an auction item? For more information on how to donate an item for auction, please visit our auction page. If I am the successful bidder on an auction item will I receive a tax receipt? If an auction item is purchased, a receipt is issued for the portion above and beyond the value received by you. For example, you have paid $100 for an autographed book – the fair market value of the book is $25. The eligible amount of the receipt is $75. How can I bid on an auction item? Bids are taken over the phone during the live broadcast. The last bids are taken by phone at 5 pm (Atlantic). We will request all bidders to provide contact information the first time they call in before placing a bid: name, address and two phone numbers where you can be reached. If you plan to bid during the final hours of the telethon it is recommended that you call earlier in the day to register! You can also join the live action as an “in studio bidder”. Contact us to join Steve Murphy in the studio during the next live broadcast. How much money has the Christmas Daddies Telethon raised? The Christmas Daddies Telethon has raised over $31 million since 1964. For more details and total amounts raised per year, as well as a breakdown by region, please see the Amounts Raised section on the Telethon page. Can I watch the Telethon online? A live stream of the Christmas Daddies Telethon will be available during the live broadcast, check back here closer to the Telethon for details! If I missed watching the Telethon, can I still donate? Click on our donate page and use Visa or MasterCard. Visit an RBC in Atlantic Canada with cash, money order or check during the months of December January and February. Drop a check or money order in the mail made payable to Christmas Daddies click here for mailing address. Donations received before December 31st are eligible for a charitable tax receipt in that year. Donations received after January 1st are eligible for a tax receipt of that year. Can I volunteer for the Christmas Daddies Telethon? Thank you for wanting to volunteer but we not accepting volunteers at this time. Traditionally, our volunteer positions are filled from within CTV by employees, family members and friends. The job of answering phones is filled by Bell Aliant Employee Volunteers and Bell Aliant Pioneers. We encourage groups, businesses or individuals to organize a fundraiser and come on the Telethon to present their cheque. If this is something you want to do, please contact our office and we can schedule you a time during the live broadcast to present your cheque! If you would like to help the Salvation Army, our partner in the distribution of toys and gifts, in their toy packing centres or on distribution days please reach out to your local Salvation Army. What fundraising events are organized throughout the year? Check our news and events page for a list of the latest fund raisers and news updates. In previous years the Christmas Daddies Association of Halifax held additional fund raisers such as a Spring Fashion Show, a Black Tie Dinner & Auction and an Annual Golf Tournament. It has been decided to concentrate efforts on the telethon, and these events no longer take place. However, some groups such as Big Leagues Beverage Room and the Fleet Diving Unit (Atlantic) hold fundraising events on our behalf throughout the year. If you wish to hold such an event yourself, please contact your local Christmas Daddies office for information and guidelines. Your efforts are very much appreciated! Can I purchase older versions of the Telethon from years gone by? We are often asked for broadcasts from older archived shows in the 60s, 70s and 80s. We do not have them. The earliest recorded telethons available begin in 1990. We do not have the ability to isolate one performance or appearance. We are slowly adding past telethons to our YouTube Channel. We encourage you to check out our YouTube Channel. Read the whole story about the History of The Christmas Daddies in our History Section. I missed the telethon! Can I watch online? There are many more great Christmas Daddies videos.